The worst, first, all right? The infamous SAHARA MUSTARD (Brassica tournefortii) must be pulled whenever and wherever you can. I stopped roadside and grabbed the specimen below. Compared to the other two mustards, which resemble ordinary garden plants, Sahara mustard is on steroids. The leaves are dense and dry like cardboard, of dull color, and the stem is covered in stickers (you’d have to wear gloves, or be foolish, to pull it – guess which I was!). The seed pods are hard and bumpy, like a neglected dirt road or a bandolier. 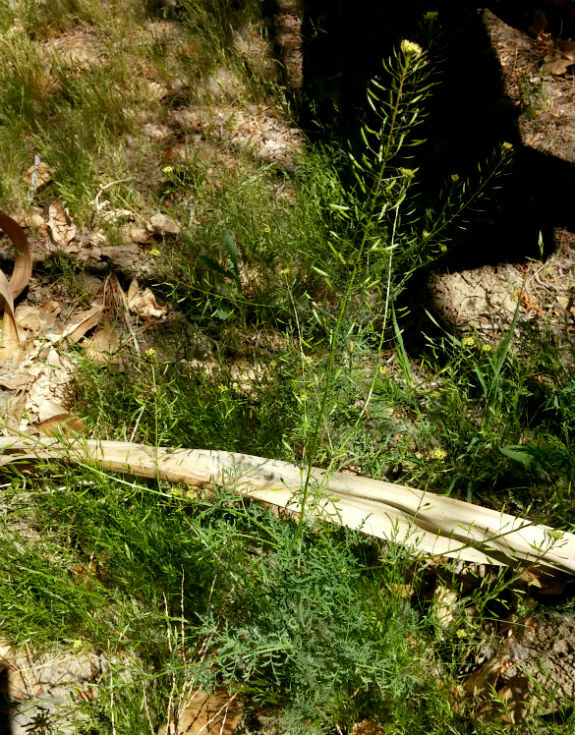 The plant is high in oxalic acid and may be toxic to desert herbivores. In no way could this plant be considered an edible. 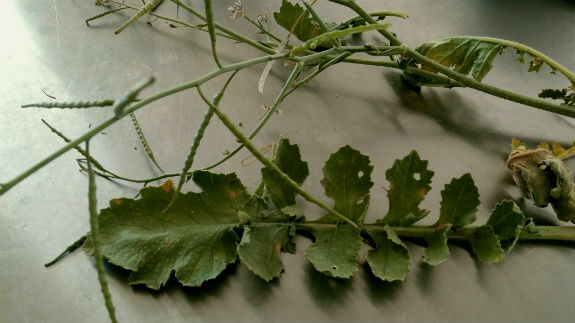 Another exotic and invasive mustard is LONDON ROCKET (Sisymbrium irio). What it lacks in fierceness it makes up for in flavor. It is edible and depending on where it grows it can taste exceedingly hot, to pleasantly hot and sweet. This is the mustard I’ve found growing in my yard, the one I eat the tops off of when I’m walking around. 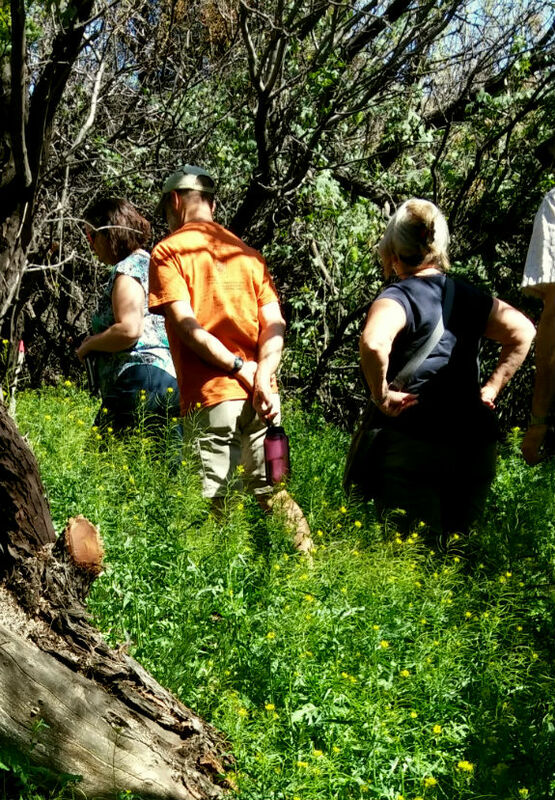 It is invasive, and has taken over sections of the Morongo Preserve (see photo to the right, hikers hip high in mustard), but from reading the literature it seems that native plants have been able to take back some lost ground. London rocket is not as prolific or as damaging as Sahara mustard and on our property the sun seems to take care of anything I haven’t eaten or pulled. London rocket sprouting. The tender greens and flowers are edible. The third mustard featured today is WESTERN TANSY MUSTARD (Descurainia sophia). This plant is native to our area, not invasive and if you find it on your property you might want to cherish it with a little extra water. 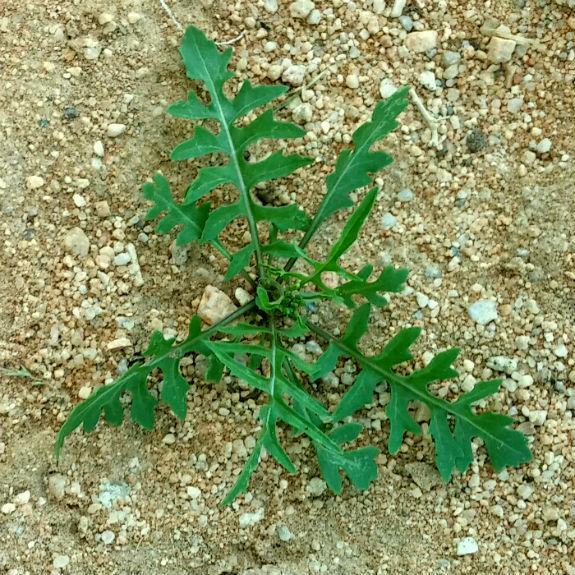 The leaves are grayish and feathery, the seed pods huddle close around the stem; it is orderly and not rangy like London rocket, It is delicate and unassuming, unlike the bullying Sahara mustard. The flavor is very mild, a little too mild for my tastes. It was a green utilized by native peoples. If you do work with the angels and pull Sahara mustard where you find it, please place the plants in black plastic garbage bags and tie the tops. If you pull them and leave them on the side of the road the seed pods will dry and open and spread hundreds of seeds. Thanking you in advance for any pulling that you do. Biological Soil Crusts - NOT BORING, seriously!